The circular installment and positioning of each frame displays the endless repetition of the cycle and the grace that can be found in the fleeting moments of acceptance. Each photograph was taken by the artist to record locations on the road to recovery. (These are scenes from the Greenway Snowmobile trail that runs through Belfast, NY.) 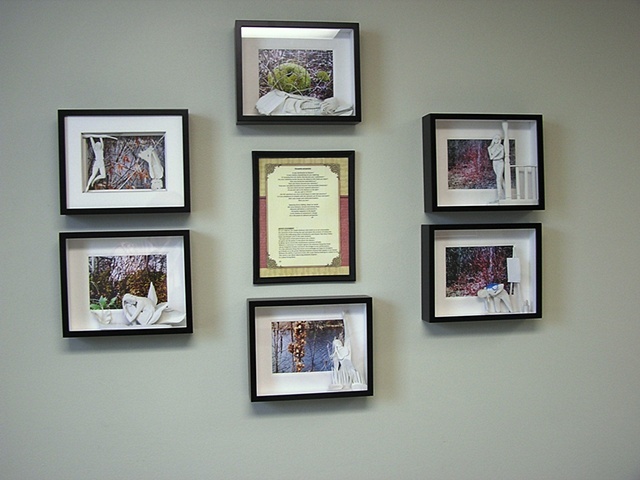 The images are framed by paper sculpture which amplifies the significance of the view at each location. The paper sculpture process was used as part of the artist's personal healing process to recover fine motor skills from May to September 2009.